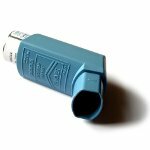 World Asthma Day is an annual event held on the first Tuesday in May. It is organized by the Global Initiative for Asthma, a medical organization that focuses on reducing asthma prevalence, morbidity, and mortality. Asthma is a common disease of the bronchus. Its chronic nature manifests itself in recurring airway obstruction and bronchospasm. Asthma attacks are usually treated with bronchodilators (inhalers) and steroids, but acute severe asthma does not respond to standard treatments and might cause death. World Asthma Day was first held in 1998 in more than 35 countries. The event is aimed as raising public awareness about asthma and improving asthma care throughout the world. Each year a new theme is chosen by GINA, which is responsible for distributing appropriate resources and materials to participants. World Asthma Day events are organized in each participating country by local health care groups, health care professionals, educators and individuals who want to assist in reducing the burden of asthma. World Asthma Day activities may include but are not limited to public open days at hospitals, free asthma screening, meetings of health professionals, media campaigns, debates, school activities, panel discussions etc.